Designer style screw top pens. At Plummer Pens we aim to provide top quality products and total customer satisfaction. All of our writing instruments are individually handturned using only the finest materials. Because of the nature of the materials each pen is unique no two pens will ever be identical, each item is carefully designed and crafted to complement its intricate features. Most of our products are purpose made to suit your precise requirements but we do carry a small stock of most designs to support our bespoke range. Bespoke handmade writing instruments in a variety of materials and styles. 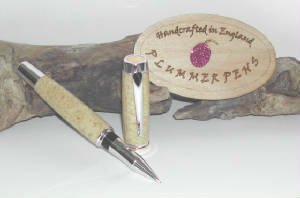 Gentlemans Rollerball in Stabilised Box Elder. Only a small sample is listed so far.